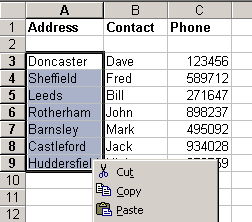 Many customers have spreadsheets containing rows that have an address column, and then many other columns containing relevant information to the row. It's a common requirement to want to apply the optimal route calculation result of the address column to the rest of the spreadsheet. Lets go through the process of altering the spreadsheet to facilitate automatically applying the results of an optimal route calculation to the rest of the spreadsheet. 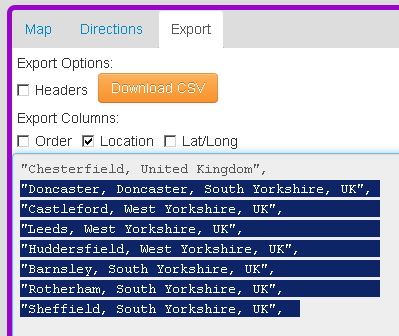 As shown above, the Export tab lists the Start Location and Route Locations (please see our previous Export Tab article for more details). 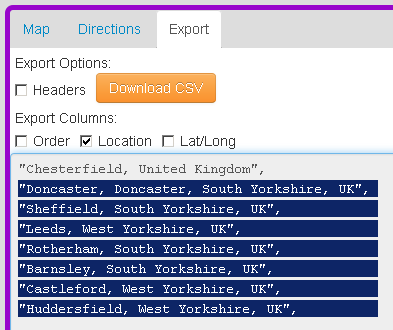 We originally only exported the Route Locations from the spreadsheet, so select all but the first fully qualified address and copy to the clipboard. The exact content of the formula will depend on your own spreadsheet layout, but the intent is that for each cell in the "Swap Order" column, the formula will MATCH the content contained in the cell of the same row from the Full Address column against the entire content from all the rows in the New Order column. The purpose of this will soon become clear! As can be seen in the above example, because the "New Order" contents are currently the same as the existing order, the "Swap Order" column counts from 1 to 7 as the order is currently correct. The original spreadsheet has now been modified so that the results of an optimal route calculation can be automatically applied. You can see above that the contents of the "Swap Order" column have automatically recalculated to show the order that the rows of the spreadsheet should now be in. 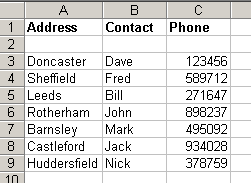 In the above example, Sheffield was originally the second row, and has moved to the last row in line with the optimal route order, and Fred and his phone number has also moved with the Sheffield entry.